So today is July 2, 2014. “Why is that significant?”, you ask? Well, today marks six years since my first craniotomy to remove the tumor. Not a day goes by where I don’t think about that day, or the endless possibilities that leave me asking “what if?” The night before that operation, I prayed that that night would not be my final night on this earth. But here I am – tougher than ever. At first, the one-year, two-year marks were somber reminders of what I had gone through – the travesty and fright that my family and I were faced with. But now, they are cause for a celebration, or a “Brainaversary” as I like to call it. 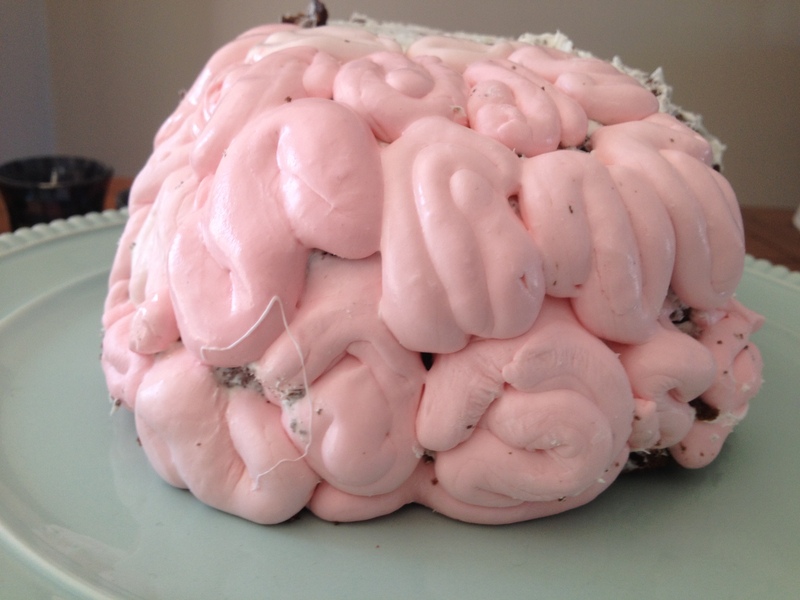 Last year, for my fifth-year Brainaversary, Ashley baked me a brain cake. Hopefully, I’ll have another one waiting for me at home today! Regardless, I wish to thank my family, friends, medical team and support group from therapy and school for their tireless support in my battle. Without you, I would never be here today. To think how far I’ve come in six short years (but what has also felt like an eternity at moments) is astounding. Without more, I can’t leave you hanging so I’m going to get back to the story. After all, my intent in writing this blog is not to gain sympathy votes but rather to inspire and connect with other warriors out there. Back on March 11th, I wrote about waiting. Reverting back to 2011, I was in a waiting period for the bar exam results to be revealed. I’m not sure what was worse – taking the bar or waiting for results. The exam lived up to all of the hype. “Grueling” is the word I would use to exemplify the entire process. Nothing could have prepared me for the moment I walked into the room and was handed the exam booklet. Prior to that though, I was taken into the room where I would spend the next 4.5 hours. After booting up my laptop and waiting at the prompt screen to type in the word “Start” to bring me to the first blank sheet of paper for my response, I waited some more while further instructions were read. At least some states, including Connecticut, now allow examinees to complete the essay portion using exam software that you must download and pay a license for. Ahh yes, more money. The overwhelming feeling of sitting with the Bar Examiner who gave the instructions to applicants with disabilities made it all become real. All examinees must sign an oath and are then escorted into their hotel room where you are instructed to start your laptop and log in to the software. Finally, I was handed the first six essays. I took a deep breath, collected myself and then focused my attention on the task at hand. While applicants can begin with any number they want, I started with number one and away I went. The first six questions were pretty much what I expected and though I could have written for days, I did not have the stamina or time to do so. Before I knew it, time was up and I had completed the morning session of day one – 1/4 of the bar exam was complete. Given that the break was only an hour, and at the advice of past applicants, I brought my lunch. I was able to find a private, quiet seat outside where I ate – all while being completely exhausted and wondering how the hell I was going to go back in there and write for 4.5 more hours. But I had to, and I did. The six questions administered after lunch were even harder, but maybe that’s because I was drained from the energy expended on the first six and the work-up that I put into this day. Nonetheless, the questions all called for responses that I knew, except for one but it’s okay, I made some stuff up and explained my reasons for what I was saying. Before I knew it, time was called and day one was over. Day two of the bar exam is known as the Multistate Bar Exam (the “MBE”). You know…those really long multiple choice questions that I described in part one of this post. After the morning session and 100 questions, I was mentally and physically exhausted. I had no energy left. On my lunch break, I wanted to just put my head down and take a nap. I was so close now though – I would fight hard until the end, just as I had done in getting to this point and putting myself in a position to be sitting at the desk taking the exam. Yet, questions 101-200 were more of the same: oddly worded questions, many filled with old, ancient law that required you to have a brain like a sponge. Thanks BarBri for the charts telling me that these types of questions were only tested a very small percentage of the time. However, the clock continued to wind down and the 6:00 hour approached. Finally, with a few seconds to spare, I had bubbled in my final marking on the scantron sheet. Jubilation! I had just completed the bar exam. Where were all of the people who said that I would never return to law school, let alone graduate or sit for the bar? What about the medical report that stated I should forget about going back to law school and was likely to remain at the capacity of a second-grader? When I got home, I had a celebratory dinner with my family who was there for me every step of the way. I had nothing else to do but to sit and wait for results. In the months that followed, I replayed questions over in my head again and again. Fortunately, I returned to work at law firm in Connecticut where I was keeping busy in the asbestos defense practice. October 7, 2011 was a bright and sunny morning. This was the day the Connecticut bar exam results were to be released. In Connecticut, the committee simply posts on its website the names of those examinees who passed the exam and are recommended for admission to the bar. So everyone and anyone can get onto a computer and look – not the fairest or best way for nervous examinees. Nonetheless, I was confident this morning. More than two months removed from taking it, I truly felt that I had passed and was about to burst into tears of joy. After refreshing the page time and time again, the list of names appeared. The names were presented in alphabetical order by the applicant’s last name. Slowly, I scrolled though until I came to the C’s – there were lots of them. I looked away from the screen, collected myself and then refocused my eyes on the screen. I went one by one and low and behold, my name was not on the list. I tried again and again, thinking perhaps I overlooked it in anticipation of the excitement. But reality set in and my name was not on the list. As a result of working for a law firm and all the attorneys having gone through the process, they knew that the results were also posted. Before I even had the time to process what had happened, I received email after email offering condolences. I needed to talk to my family; to Ashley – I could not handle the moment. Within minutes, I received an email from the office administrator offering me the rest of the day off if I wished to leave and be with my support group at home. The feeling of defeat stung for a little while. But I had overcome so much that I knew I would be back to try again. When I received my actual results from the Bar Examining Committee, I saw the score that I earned and the score needed to pass. Without revealing the number, I knew I had to go for it again; I’d be a fool not to. In the ensuing months, I geared up for the February 2012 exam and worked with a tutor to master the methods to take the exam. One of the things that I learned from my score is that it was not a lack of knowing the information, but rather, there exists a defect in my ability to communicate my mastery of the subjects in my brain into the multiple choice answers that were provided after each question. I’ll tell you this much – my essay scores were well above-average. Given ample time and opportunity to explain my reasoning and analysis in reaching a conclusion, I have no trouble. But when I am presented with a long and complex problem with four possible answers, all of which could arguably be correct, I have trouble. I worked tirelessly to master the technique of reading and analyzing within the strict time constraints presented on the bar exam. Now, for those unfamiliar with the process, only your scores on the multistate bar examination can be used on subsequent examinations but your essay scores cannot. So my strong essay scores would go to waste. I had no choice but to study and prepare for the entire exam again. I took a leave of absence from work and locked myself in a room and library for the winter months. The tutor provided me with some suggestions on how to approach the questions and additional tips to narrow the possible answer choices down to two. From there though, it was a matter of processing the right answers from the wrong answers. The bar exam does not test how smart you are. Rather, it is a test of endurance to see if you can arrive at the “best” legal conclusion to a problem in a short period of time. After two days and six hours, you will have handled two-hundred-and-twelve legal matters and counseled that many clients. When time was called for the final time, I felt once again that I had done it. Fast-forwarding to May 11th – results day. Like a nervous wreck, I checked and checked the website until the list had been published. I looked for my name, but again, my name did not appear. Upon seeing my results, I was astounded to find that my multiple-choice score had improved but my essay scores had dipped. Go figure. As a result, I was right where I was the first time. There was no fluctuation in my score. Well, the old saying is that the third time is the charm so I decided to try again. I took some time off in between administrations of the exam to give myself a mental break and gear up for the studying and preparation. I also had to find a way to pay for my life so I waited until July 2013 to retake the exam. In addition to the financial situation, I figured that some time would be the best thing for me. I still had all of my books to prepare and after much research and reviews, I opted to purchase flash cards to help me ingrain the material in my brain to allow me to quickly recall and spit out the material when I was presented with a problem on the exam. After another leave of absence from work and countless hours of my life devoted to studying, the two days arrived. I was again escorted into my private room where I would spend the next two days killing the rest of my good brain cells to pass the test. But in what felt like a snap of the fingers, it was over and I was on my way home. At the time that I registered to take the exam, I did not think to look when the bar exam results were going to be posted. Yes, they actually tell you the dates the results will be released for the next three years that the bar exam is administered. So I tell you this because on October 4, 2013, bar exam results were released – and I was on my honeymoon in Italy. I dreaded the moment, but had to look – after all, I told Ashley that if I passed, I’d buy her a Louis Vuitton. Plus, I just had a feeling that my luck was about to turn. I had been through hell the past five years but had just married the girl that I loved and was with her eating everything in sight and drinking the best wine on earth. So despite the data plan that I was paying for, I did it all through my phone. And when I checked, I felt the same semblance of defeat I had grown accustomed to. My name was not on the list. That was all that I needed to hear. I knew in my heart that right now, passing the exam was not meant to be, for reasons outside of my control. The law may have won this time. But at the end of the day, I’m alive and well. I have my whole life to live and an exam cannot and will not define me. July is a somber month for me. I’m at the 3 year mark from diagnosis and surgeries. And, since I’ve always been big with numbers, etc. I chose to do something to commemorate those days for me. So, while I don’t have anything planned for the DX date, I am going away for the night of the first surgery. Just me. Got a hotel room booked and I’m so excited for it! The first year I went out of state with my family, and last year I kayaked for the first time EVER! I’m all for doing BIG THINGS (hah) for me on July 27. NOW, the decision is should I do something on August 4 (the 2nd surgery date)? 🙂 hah. Thank you! It’s exciting to commemorate and celebrate the anniversaries of these significant dates. I never would have expected to enjoy them, but I’ve learned to embrace the day – I guess that’s just my new view on life overall now though. At least for me though, I prefer to celebrate just one surgery per year so that I don’t lose perspective of this journey. But I don’t want to give the story away, so I’m going to leave it at that!